Are you hosting a Kentucky Derby Party on May 5th? If you are or if you aren’t Mint Juleps are a classy drink that can be served at any spring or summer party. Boil 2 cups of sugar in 2 cups of water for 5 minutes. Place the mixture in an airtight container with 6 to 8 sprigs of mint; refrigerate overnight. 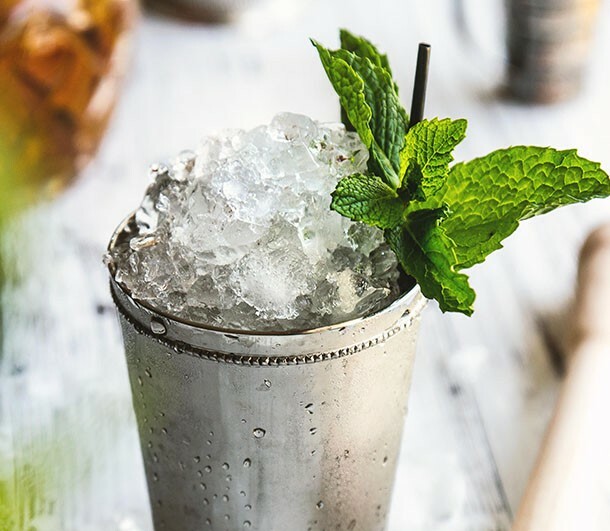 On the day of your party, fill a cup (silver julep if you have one or a glass if you don’t) with crushed ice, then add 2 tablespoons of mint syrup and 4 tablespoons of whiskey. Stir well and garnish with mint. Enjoy — preferably while sporting a fancy wide-brimmed hat. This entry was posted in Drinks, Food, Uncategorized and tagged Parties.